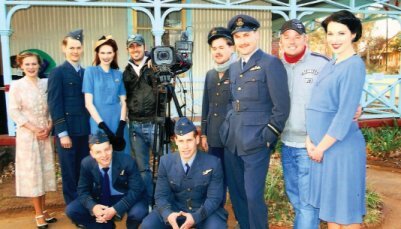 Scenes from ‘Angel of the skies’ were filmed at Cullinan’s historic McHardy House Museum in July. This is a Second World War movie written and directed by South African movie-maker Christopher-Lee dos Santos and produced by Andrew Eric Macdonald. It tells the story of a South African pilot who flies for the Royal Air Force and leads his crew into war. On a bomb raid they have to face life and death experiences. Christopher’s ‘At thy call’, a short film about the border war in Namibia, set in 1984, was the only South African short film to be screened at the Cannes film festival in 2008. Christopher also made ‘Eternity’, a vampire-styled thriller set in Johannesburg and released on circuit in December last year.